Wishing you a very Merry Christmas and Happy Holidays. I hope you had a great time with your family and friends. We sure did, with a whole meal of Goan foods. Recipes will follow the next couple of weeks. If you are looking for some dessert ideas and something different for the New Years, then this recipe definitely wont disappoint. Plus its gluten-free. 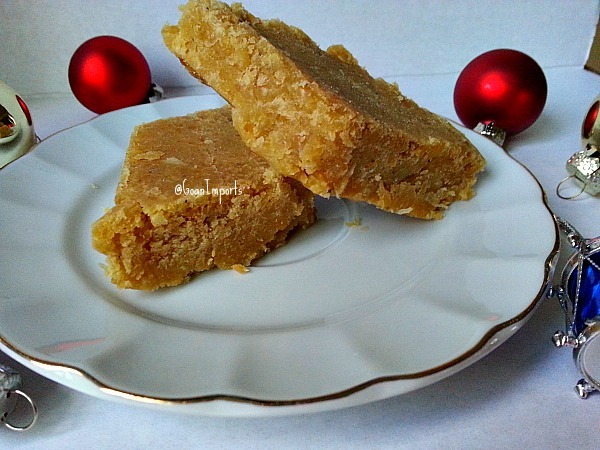 This popular Christmas sweet in Goa is also called a Doce de Grão(Gram Sweet) in Portuguese and Chonya Doce in Konkani( Local language in Goa). 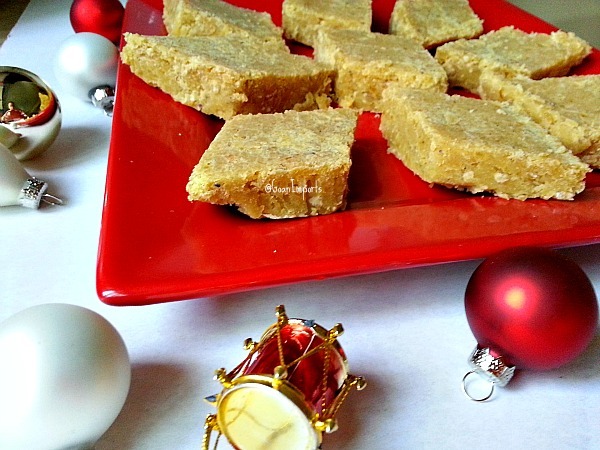 The garbanzo coconut bars has 5 ingredients. Its super easy just a bit of patience is all you need :-). 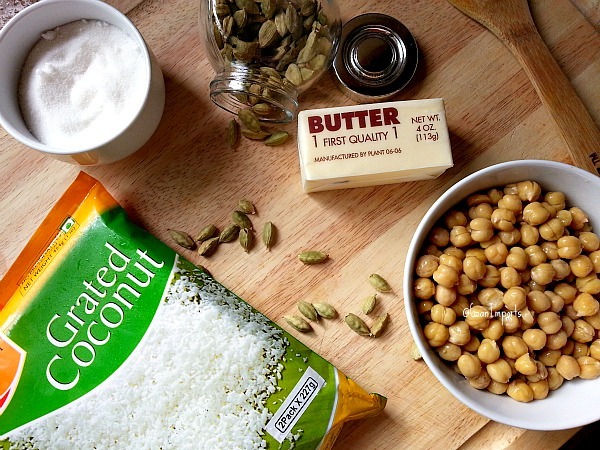 * In a non-stick pan add the grated coconut, mashed beans, cardamom and sugar on medium heat stir with a wooden spatula it will become softer as the sugar melts. Keep stirring slowly and continuously for 45 minutes. Add the butter and stir till the mixture pulls of the side of the pan and does not stick to the spatula. 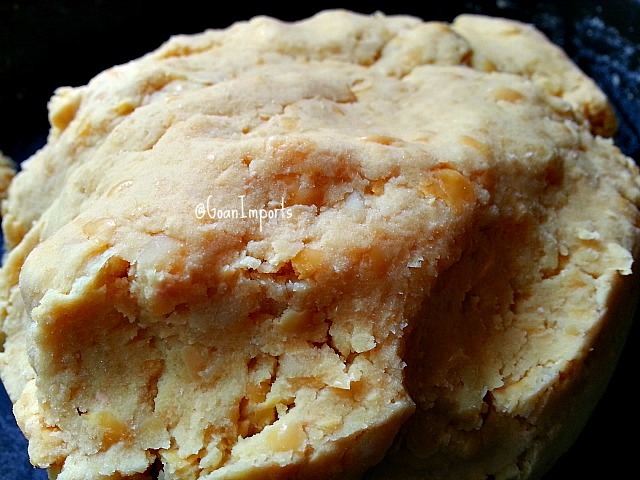 * Butter either a 9×9 pan or 9×7 pan and flatten the mixture evenly. Cut diamond shapes and cool. Once cooled take each piece out carefully with a flat knife and you can store refrigerated for about a week or two. I think I might want to make this.. Even if we are in the middle of summer in London.. At least I’d have practice for when Christmas comes up! This looks goood! When I was in New Zealand there was this little shop of Indian sweets and their front window was piled high with bars and cakes and little chevrons, balls, and triangle of a vast rainbow of colours all with this texture and I always meant to try them. I feel like they would have been very much like this! Im thinking of making these as a special treat.. Im trying to eat less sugar, do you think they would work as well if I cut down the sugar in the recipe? Yes Kara, it will work with less sugar. The texture will be softer as sugar hardens the squares. The Indian bars are mostly made from milk, cashews and almonds. This looks amazing! I love the idea of using chick peas in dessert. Thanks HotDish :-), I hope you try the recipe. Thank you WG, they do taste really good and are addictive.